4.0 out of 5 based on 28 bloggers and 12 commenters. 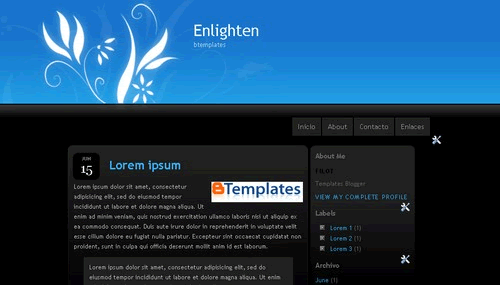 Enlighten is a free blogger template adapted from WordPress with 2 columns, right sidebar, floral motifs, gradients and vectorial elements. Primero que nada, felicitaciones por tan buena página de Templates. Segundo, tengo un problema con este Template en particular, a ver si ustedes me pueden ayudar, cuando me meto en el panel de Blogger para modificar los elementos, el elemento “Cabecera” me sale muy desplazado hacia la derecha y no puedo modificar por ejemplo, la imagen de la cabecera (acá dejo una captura de pantalla si no se entiende lo que digo). ¿Hay alguna manera de aparezca como se debe? Ups, error mío, esta es la captura de la pantalla. Great Template. Thank you for sharing it. I love this template and am using it, but my images haven’t been loading the last 2 days. Any tips? Why aren’t the images loading for this template? My “Comments” is not working… someone can help me ? Hello this template is great but now there is no background at the top. It’s just black. otherwise I wonder what to do. I have been using this template, but there’s something wrong with it now. The header picture isn’t showing anymore. What’s wrong?? The problem is that the author hosted all images in a free image hosting which has a limited bandwidth. We are considering to replace all image links; however, in the meantime, you may download the original CSS template (designed by freewordpresslayouts.com), take the images contained in the package, upload them to your own filehosting and then replace them in the original Blogger template. I am trying to make this template a little wider to better showcase my photos. But somehow I can’t get the “boxes” on the sidebar and the main post to line up. Can anyone help?